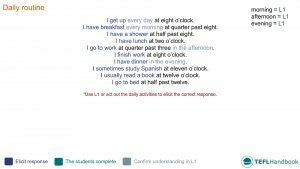 A collection of ESL activities, games and resources for teaching daily routines to beginners (A1). This lesson plan includes a sample board and several ideas for practical activities and games. The board below offers one suggestion for a lead-in activity. First, try to elicit the different times of day and add them to the board, you may even add the L1 translations. Next, step through the activities of a typical day, eliciting as much as possible through mime or use of the student's L1. You'll find that students at this level are already quite familiar with quite a few of these. If you use an iOS or Android device, don't forget that you can get offline access to these boards through the TEFL Handbook app. The students write about their own routine using the new language from the board. This ESL writing activity follows on from the board work. The students will create daily routines for themselves, using the sample board as a guide. Students answer questions about their daily routine. Move around the class asking the students questions about their routines. Teacher: What time do you have Breakfast? Student: I have breakfast at eight o'clock. The students will work in pairs and interview each other about their daily routine. We switch things up for this ESL group speaking activity. Now the students will be interviewing each other about their daily routine using the same 'What time do you...?' questions as the previous activity. 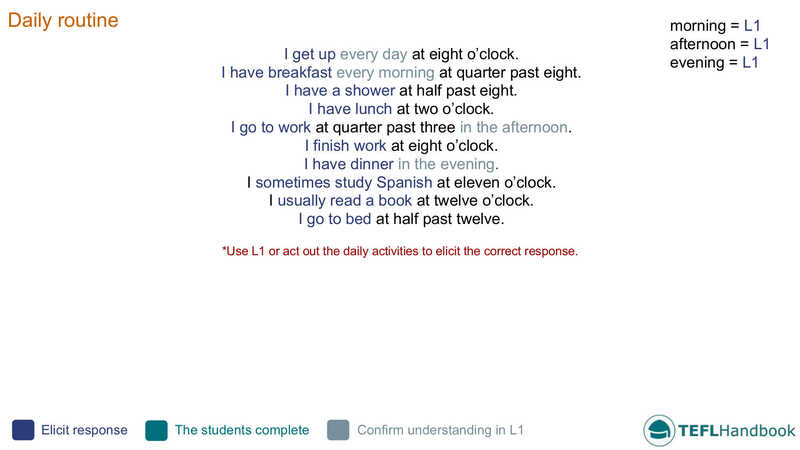 Quiz the students on their partner's daily routine. Teacher: What does Mark do on Thursdays? Student: On Thursdays, he plays football. What do you do at...? Players have to guess the activity that a classmate does at a specific time. Teacher: Okay Juan, what time have you written down? Teacher: Team B, what do you think Juan does at half past two? Team B: We think he finishes school at half-past two. Teacher: Juan. Do you finish school at half-past two? Teacher: Well done! A point for Team B. If you're looking for a worksheet to revise this topic at a later date, we recommend Daily Routines on iSLCollective. Also, this daily routines picture dictionary and word search makes for an excellent group activity for young learners. If your class is equipped with video and internet, try to make a fun activity out of the video below by pausing and asking questions as each activity is displayed. If you've found these ideas useful, have a look our complete list of ESL lesson plans for beginners (A1 Mid-level), as well as our entire collection of ESL lesson plans. Are you an iOS or Android user? Then you should give our app a go! The TEFL Handbook app has over 100 lesson plans, 300+ ESL activities and over 100 ideas for classroom games. All of which can be accessed offline, perfect for quick reference in the classroom.